This brief, which draws on interviews with Luna County stakeholders and secondary data sources, provides information about local government-policy opportunities and challenges in the food system to inform the work of the GFC steering committee and stakeholders in Luna County. Given these challenges, economic development is a priority for the community.7-9 One strategy to promote economic growth in the county has been to keep property tax rates low, which are among the lowest in the state.9 Community stakeholders acknowledge that it is difficult to facilitate economic development without changing the county’s rural character.9 Although vestiges of hardship persist, community members are working to implement additional strategies to improve the quality of life, such as exploring the potential for food systems to spur economic development. Community leaders note that Luna is an “incredibly giving community. [When] somebody stumbles and falls… [or] a little tragedy [happens]…, it’s amazing to see how the community pulls together.”13 Indeed, the community is pulling together to promote food security and agricultural viability in the county. Agriculture depends on the availability and quality of land and water in the county’s arid climate. About one-third (29%), or 550,174 acres, of land in the county is used for agriculture. Of the land used for agriculture, only a small proportion is cultivated as cropland: 6.8%, or 37,210 acres.14 Farms vary in size, ranging from a few acres (one to nine acres) to very large farms encompassing over 1,000 acres.14 Approximately half of the farms (52%) in the county use irrigation.14 The county also reflects a growing interest in urban agriculture. In the Village of Columbus, a public-civic collaborative partnership established a community garden with 12 raised beds of four-by-eight feet each.7 The Village of Columbus provided the land and installed water lines to each raised bed; New Mexico’s Economic Development Department provided initial grant funding to build the raised beds;16 a local nonprofit, Friends of the Columbus Community Garden (FOCCG), runs the daily programming.16 Programs teach participants gardening techniques, including starting seeds, weeding, composting, and rainwater harvesting.7, 16 The partnership hopes to increase interest in gardening and access to healthy foods. Water in Luna County, as in much of the Southwest, is more valuable than gold. The only naturally occurring water source in the county is the Mimbres Basin, a closed water basin whose recharge depends on rainfall20 and snowmelt.4 Residents obtain water for municipal (domestic) and industrial uses through groundwater pumping made available by municipal utilities.4 Municipal utilities operate well fields within the municipalities, 12 in Deming and three in Columbus.4 Projections suggest that well fields will have difficulty meeting demand for water between 2040 and 2060.4 Agricultural producers have individual wells that supply their operations. The combined effects of increased salinity due to mining of the aquifers and the effect of climate change on snowpack formation and spring runoff are likely to sap water resources in the county.4 Therefore, purposeful management of the limited water supply for multiple users is paramount to the viability of agriculture. To overcome constraints on water resources, farmers and municipalities have developed coping strategies. Farmers are switching from flood to drip irrigation to practice higher efficiency and conservation of water.8 The shift to subsurface drip irrigation also lowers the cost of pumping groundwater.9 However, not all farmers are switching; operators of larger farms can more easily afford the new drip-irrigation technology, compared to smaller farms.9 Federal funding from the USDA is available to farmers to defray the cost of new technology. To be eligible, farmers must have irrigated their land for at least two of the last five years.21 However, when federal funding became available, operators of many small farms had coped with the drought by allowing their land to remain fallow for more than three years.9, 21 The fallowing of land for more than two of the five years makes smaller farm operators ineligible to apply.9, 21 Lack of access to affordable water remains a challenge for urban growers, too. One community stakeholder reported that participants in the FOCCG community garden find it difficult to pay for municipal water to grow their crops.7 To overcome this challenge, FOCCG teaches and promotes rainwater harvesting. A lack of local aggregation facilities also makes it difficult for farmers to bring their product to market. 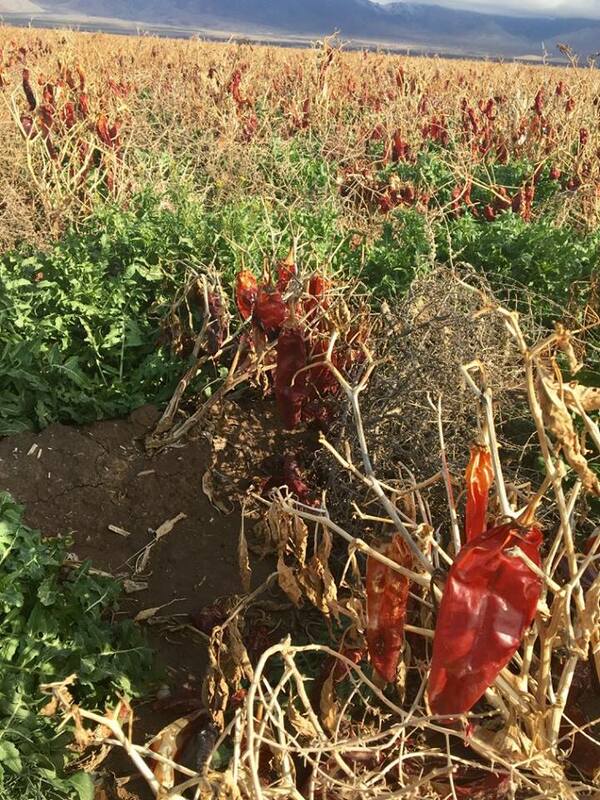 One critical piece of missing infrastructure is the lack of food processors for key crops such as pecans, onions, and jalapenos. The lack of local aggregators and wholesalers makes it more economical for farmers to send their agricultural products to a distributor in Texas rather than to supply the local market in Luna County.8 Similarly, retailers find it more convenient to purchase produce from a wholesaler than directly from local farmers, as one local interviewee explained: “Buying from local farmers is more work; and, farmers cannot guarantee safety of produce, while aggregators and wholesalers do.”13 Additional local infrastructural constraints include the absence of a slaughterhouse, commercial kitchen, and cold storage facilities.15, 17 The lack of wholesale and aggregation facilities in the county is a missed opportunity for creating direct connections between farmers and retailers. Finally, the lack of an adequately trained workforce poses challenges to long-term agricultural viability. Farmers are aging, as in the rest of the country. Many interviewees perceive that local residents do not want to work on farms.8, 15 The labor shortage is affecting both conventional agriculture and urban agriculture efforts.8, 15 The county operates a community garden but has been unable to entice community members to work in the garden.8 The county leadership is exploring the possibility of having youth from the juvenile detention facility work in the community garden. Community stakeholders view the development of an effective solution to the labor shortage as critical to sustain agriculture. Luna can draw on its strong heritage in farming and ranching to enhance agricultural viability. 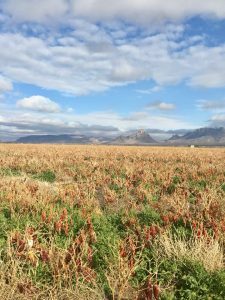 While its changing climate presents new challenges, it also provides a long growing season and favorable conditions for specialty crops. As mentioned above, local government agencies and non-governmental organizations are exploring solutions to some of the challenges that confront farmers in Luna, especially around access to water. A key challenge is that many existing policies and programs benefit operators of larger farms rather than small farms. A commitment to reducing barriers for small farmers, as well as urban farmers, offers opportunities to strengthen agricultural viability in Luna through local government policy. Beyond programs and policies, there is also a need for and opportunities to invest in physical infrastructure development such as food processing and storage facilities. Along with hunger, poor health outcomes are also a concern in Luna County. The Center for Disease Control and Prevention (CDC) reports that in Luna County, 10.6% of adults over 18 are diagnosed with diabetes and 24.3% are considered to be obese.24 Interviews in the community affirm concerns about diabetes.7 Data also suggest that only a small proportion of adults (18%) and youth (18.5%) in Luna County consume the recommended amount of fruits and vegetables.25 Poor diet, food insecurity, and poor health outcomes reflect the county’s socioeconomic challenges. Fortunately, several local initiatives provide relief from the food deficit faced by the 21.6% of households in Luna County that receive assistance from SNAP. One initiative provides free breakfast and lunch to children in the school district.17 The Deming School District also runs a backpack program that provides food for children to take home over the weekends.17 Community stakeholders report that for some children, “…the only meals that they [get] are at the school. And that’s why [the program provides] free meals at … school for breakfast and lunch.”17 Additionally, the Helping Hand food pantry, with support from other organizations, provides a safety net for households in the county. A local grocery store (Peppers) provides a discount of up to $1,500 for food products and produce to the regional food bank, Road Runner, which delivers food to Helping Hand once each month.13 Helping Hand then makes this food available to hungry people. Although these initiatives alleviate hunger, systemic changes are needed to ensure long-term food security. A strong policy environment can positively transform a food system by simultaneously improving agricultural viability and reducing food insecurity. In Luna County, the government has played a leadership role to improve conditions, as detailed below. The county’s comprehensive plan supports preservation of agricultural land uses as a strategy for maintaining its agrarian identity and addressing food insecurity.4 The plan notes, “retaining local agriculture rises to a level of protecting public health, safety and welfare.”4 Among its numerous goals and associated strategies, the plan advocates the adoption of a “Right-to-Farm Ordinance,” development of critical management areas (that include agriculture), and encouragement and incentives for compact development patterns (cluster development) near municipalities, to minimize sprawl and maximize efficient use of existing infrastructure.4 Luna County’s comprehensive plan is an important tool that can support both local farmers and food-insecure residents. In at least one instance, a joint powers agreement has been used to support food initiatives in the county. For example, a joint powers agreement with the Village of Columbus and FOCCG facilitates support for community gardens in the village.7 The agreement allows the Village to provide land, utilities, and liability insurance for the project, while FOCCG runs the programming: education, daily management, instruction, and fundraising.7, 16 The agreement allows a cooperative structure between the Village and FOCCG, which the state recognizes. This local government tool has become central to how the county supports local food initiatives.7 The joint powers agreement is a broad, flexible tool that could be applied to support other food system initiatives in the county. Another innovative tool that municipalities can use is the Local Economic Development Act (LEDA). LEDA, introduced in 1993 by the New Mexico legislature, provides a framework for local governments to use public dollars to spur economic development.29 The public dollars for LEDA are allocated in the state budget each year, and funding varies from year to year.30 LEDA allows the formation of public-private partnerships, to promote economic development projects.29 In 2013, the state amended LEDA to extend funding to retail businesses in rural areas, and subsequently, in 2014, Luna County adopted a local economic development plan ordinance that facilitates use of LEDA funding.29 Luna County has since provided both technical and financial assistance to small businesses, including those in the food sector, to access LEDA funds. For example, in 2015, Luna County provided multipronged economic development assistance to Preferred Produce, a local greenhouse producer. The county assisted Preferred Produce with its LEDA funding application to the state, access to funding, and improving road infrastructure in the vicinity of the business.8 In addition, Luna County in 2015 passed a local ordinance to recommend that Preferred Produce be awarded $135,000 in LEDA funds to expand their current facilities by 45,000 square feet.8, 31 In early 2015, the New Mexico Economic Development Department approved the expansion, which is expected to generate at least ten high-paying jobs, with a starting salary of $30,000, by 2018.8, 31 Facilitating this transformation would not be possible without the support of Luna County staff. Commitment to agriculture and food security is evident in the efforts of the county government and community groups in Luna County. Greater support by local governments can amplify these initiatives to support food and agriculture. Community stakeholders identified multiple levers of change to improve agricultural viability and reduce food insecurity. Community stakeholders recommended simultaneously increasing local production of fruits and vegetables and expanding the farmers’ market, to alleviate spatial disparities in food access.8 Interviewees recommended increasing nutritional education and awareness programming in the community.8, 9, 19 Interviewees expressed concerns that even though some schools operate gardening programs, current regulations prohibit school staff from using (cooking) garden produce as part of the school meals on site.8 Changing regulations so that they support local healthy food initiatives could positively shift the food landscape in Luna County. Below are several suggestions to help move food policy forward systematically and strategically in Luna County. 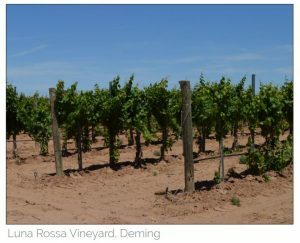 The City of Deming can carefully modify plans and ordinances to allow more agricultural activities. Currently, community gardens and urban agriculture are not explicitly permitted land uses in the city, and neither is the raising of livestock in the residential, commercial, and industrial zones.32 In addition, landscaping ordinances severely limit residents’ ability to (legally) maintain backyard gardens.32 Currently, very little land is agriculturally zoned within the city, further limiting access to land for subsistence and community agriculture. Zoning ordinances can be modified to permit agricultural activities in the city. For example, landscaping ordinances can be modified to allow backyard gardens that help recharge the aquifer through xeriscaping. Xeriscaping minimizes water use by prioritizing plants with low water usage (edible varieties include prickly pear and rosemary) and by allowing small plots of plants such as fruit trees and vegetable gardens.33, 34 Similarly, allowing certain livestock, such as chickens, within the city limits can be advantageous for addressing food security in the county. A number of local governments from across the country have taken a whole host of actions to support urban (and other forms of) community food production including by creating and implementing agricultural plans (Marquette County, Michigan); adopting supportive land use and zoning regulations (Minneapolis, Minnesota); using public lands for food production (Lawrence, Kansas); and supporting new farmer training and development (Cabarrus County, North Carolina).35 The city and county governments of Deming and Luna can leverage their communities’ assets and knowledge to create a supportive policy environment for community food producers. 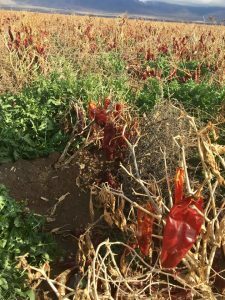 Luna County’s proximity to communities with similar agrarian conditions and challenges creates an opportunity to use regional food system approaches to strengthen rural economies. Tools such as the Joint Powers Agreements Act and LEDA can help to establish regional connections in the food system. Examples of regional approaches have been tried in rural communities elsewhere.36 Consider the case of Region 5, Minnesota, which includes Cass, Crow Wing, Morrison, Todd, and Wadena counties in rural Minnesota. Region 5 has implemented multiple actions to generate local wealth and provide access to healthy, affordable foods.39 One action has been the creation of the Sprout Growers and Makers Marketplace.39 The marketplace is a regional food distribution and processing facility serving and connecting farmers and institutions.39 As an aggregation and distribution facility, the marketplace aggregates thousands of pounds of commodities from community supported agriculture operations across the five-county region. Luna County’s proximity to other counties allows it to undertake a regional approach. Luna County can play a leadership role in establishing a regional framework, given its history of strengthening food systems by using LEDA and joint powers agreements. Information in this brief is drawn from multiple sources. Quantitative data sources include the 2014 American Community Survey (ACS) five-year estimates and the 2012 U.S. Census of Agriculture. Qualitative data include eight in-depth interviews with representatives of various sectors of the food system as well as Luna County, City of Deming, and Village of Columbus policymakers and staff. Interviewees are not identified by name but are, instead, shown by the sector that they represent, and are interchangeably labeled as interviewees or stakeholders in the brief. Interviews were conducted from April to August 2015. Qualitative analysis also included the policy and planning documents of the local and regional governments, which were reviewed for key policies and laws pertaining to the food system, and a review of the minutes of the Growing Food Connections steering-committee meetings. The GFC team is grateful to the Luna County GFC steering committee, Luna County government officials and staff, and interview respondents for generously giving their time and energy to this project. 1 Growing Food Connections, “Eight ‘Communities of Opportunity’ Will Strengthen Links Between Farmers and Consumers: Growing Food Connections Announces Communities from New Mexico to Maine,” http://growingfoodconnections.org/news-item/eight-communities-of-opportunity-will-strengthen-links-between-farmers-and-consumers-growing-food-connections-announces-communities-from-new-mexico-to-maine/. 2 C. Marquis and J. Freedgood, “Luna County, New Mexico: Community Profile,” Growing Food Connections Project (Buffalo, NY: University at Buffalo, 2016). 3 U.S. Census Bureau, 2014 American Community Survey 5-Year Estimates, 2010-2014 (Washington, D.C.: U.S. Census Bureau, 2015). 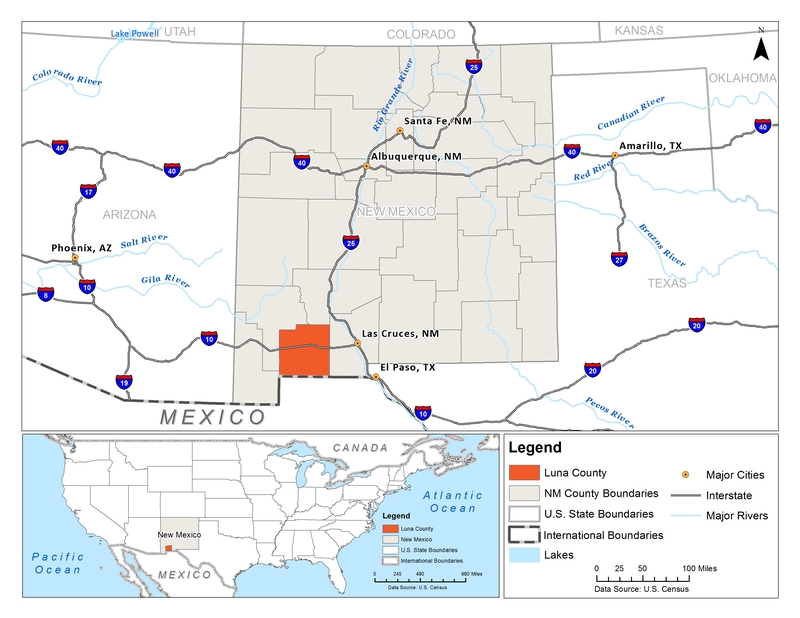 4 Luna County, Comprehensive Plan Update (Luna County, NM: Luna County, 2012). 5 U.S. Census Bureau, 2012 Census of Governments: Organization Component Estimates (Washington, D.C.: U.S. Census Bureau, 2012). 6 Colonias are communities in Arizona, California, New Mexico, and Texas, within 150 miles of the U.S.-Mexico border. Luna is home to several federally recognized colonias in New Mexico. Colonia is a federal definition used to identify communities that can be targeted for federal aid for infrastructure development. Colonias are characterized by lack of adequate water, sewage, gas systems, and decent, safe, and sanitary housing. 7 Interview with Consumer Advocate Representative in Luna County (ID 67), June 3, 2015. 8 Interview with Local Government Representative in Luna County (ID 68), June 1, 2015. 9 Interview with Local Government Representative in Luna County (ID 72), April 13, 2015. 10 U.S. Department of Agriculture, Rural America at a Glance: 2016 edition (Washington, D.C.: Economic Research Service, 2016). 11 U.S. Census Bureau, Small Area Income and Poverty Estimates Program (Washington, D.C.: U.S. Census Bureau, 2015). 12 U.S. Bureau of Labor Statistics, Unemployment Rate – Not Seasonally Adjusted (Washington, D.C.: U.S. Department of Labor, 2015). 13 Interview with Food Retail Representative in Luna County (ID 74), June 1, 2015. 14 U.S. Department of Agriculture, 2012 Census of Agriculture (Washington, D.C.: U.S. Census Bureau, 2014). 15 Interview with Cooperative Extension Representative in Luna County (ID 103), September 22, 2015. 16 K. Naber, “Garden Grows in Village,” Deming Headlight 2016. 17 Interview with Consumer Advocate Representative in Luna County (ID 69), June 1, 2015. 18 Interview with Farming and Agriculture Representative in Luna County (ID 73), June 1, 2015. 19 Interview with Local Government Representative in Luna County (ID 70), June 2, 2015. 20 On average, Luna County receives 10 inches of rainfall annually. 21 U.S. Department of Agriculture, Environmental Quality Incentives Program, https://www.nrcs.usda.gov/wps/portal/nrcs/main/nm/programs/financial/eqip/. 22 New Mexico Statutes Annotated. §72-14-3.2; 2003. 23 C. Gundersen, A. Dewey, A. Crumbaugh, M. Kato, and E. Engelhard, Map the Meal Gap 2016: Overall Food Insecurity in New Mexico by County in 2014 (Chicago, IL: Feeding America, 2016). 24 Centers for Disease Control and Prevention, County Data (Washington, D.C.: Centers for Disease Control and Prevention, 2016). 25 New Mexico Department of Health Public Health Division, New Mexico’s Indicator-Based Information System (NM-IBIS) 2016, https://ibis.health.state.nm.us/community/highlight/profile/NurtiAdultFruitVeg.Cnty/GeoCnty/29.html. 26 U.S. Department of Agriculture, Food Environment Atlas (Washington, D.C.: Economic Research Service, 2015). 27 White, Samaniego, and Campbell LLP, State of New Mexico, Village of Columbus: Basic Financial Statements and Supplementary Information for the Year Ended June 30, 2014 and Independent Auditors’ Report (Columbus, NM: Columbus Village Council, 2014). 28 New Mexico Statutes Annotated 1978, Joint Powers Agreements Act Vol Chapter 11 (Santa Fe, NM: New Mexico Legislature, 2016). 29 New Mexico Statutes Annotated 1978, Local Economic Development Act (Santa Fe, NM: New Mexico Legislature, 1993). 30 Representative L. “Lucky” Varela and Senator J.A. Smith, Report of the Legislative Finance Committee to the Fifty-Second Legislature First Session, Volume 1 Legislating for Results: Policy and Performance Analysis, January 2015 for Fiscal Year 2016 (Santa Fe, NM: New Mexico Legislature, 2015). 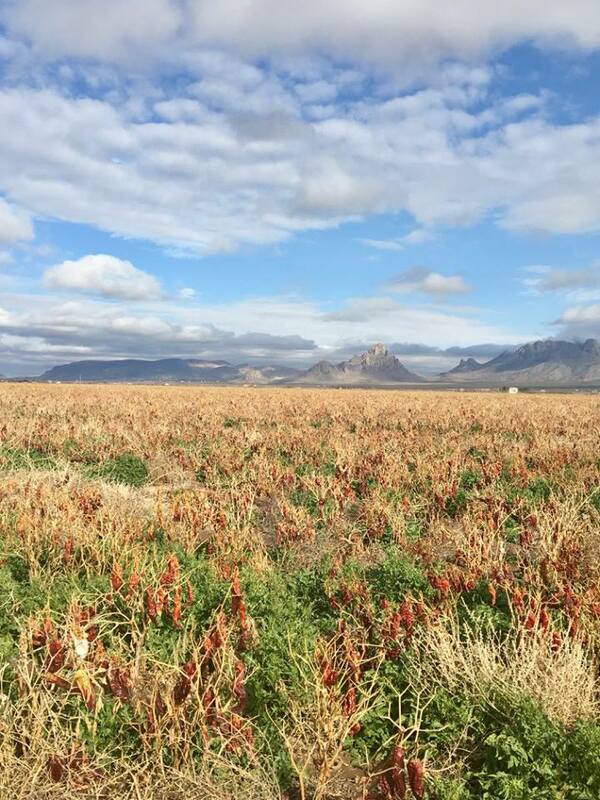 31 A. Heisel, “New Mexico Economic Development Department and Luna County to Announce Preferred Produce Expanding, Nearly Doubling Workforce,” (Santa Fe, NM: New Mexico Economic Development Department, 2015). 32 City of Deming, Zoning Regulations 12 (Deming, NM: Deming City Council, 2001). 33 C. Vogel, “Teaching Water Awareness Through Xeriscaping,” Green Teacher: Education for Planet Earth (2003): 23–29. 34 Albuquerque Bernalillo County Water Utility Authority, Xeriscaping: The Complete How-To Guide (Albuquerque, NM: Albuquerque Bernalillo County Water Utility Authority, 2010). 35 A. Dillemuth, “Community Food Production: The Role of Local Governments in Increasing Community Food Production for Local Markets,” (Buffalo, NY: Growing Food Connections, 2017), http://growingfoodconnections.org/wp-content/uploads/sites/3/2015/11/GFCFoodProductionPlanningPolicyBrief_2017August29.pdf. 36 S. Raja, J. Clark, J. Freedgood, and K. Hodgson, Growing Food Connections: Local Government Food Policy Database (Buffalo, NY: University at Buffalo, 2016), http://growingfoodconnections.org/tools-resources/policy-database/. 37 A. Dillemuth and K. Hodgson, “Food Aggregation, Processing, and Distribution,” (Buffalo, NY: Growing Food Connections, 2016), http://growingfoodconnections.org/wp-content/uploads/sites/3/2015/11/GFCFoodInfrastructurePlanningPolicyBrief_2016Sep22-3.pdf. 38 A. Dillemuth and K. Hodgson, “Incentivizing the Sale of Healthy and Local Food,” (Buffalo, NY: Growing Food Connections, 2016), http://growingfoodconnections.org/wp-content/uploads/sites/3/2015/11/GFCHealthyFoodIncentivesPlanningPolicyBrief_2016Feb-1.pdf. 39 K. Hodgson and K. Martin, “Building from the Inside Out in Region 5, Minnesota: A Rural Region’s Effort to Build a Resilient Food System,” in Exploring Stories of Innovation, edited by K. Hodgson and S. Raja, 4 (Buffalo, NY: Growing Food Connections Project, 2016), http://growingfoodconnections.org/wp-content/uploads/sites/3/2016/08/GFCStoryOfInnovation_Region5Minnesota_2016Sep22.pdf. Recommended citation: Raj, Subhashni, Joseph E. Quinn, and Samina Raja. “Supporting the Chile Capital of the Southwest: The Role of Local Government in Sustaining Farming Traditions in Luna County, New Mexico.” In Exploring Stories of Opportunity. Edited by Samina Raja, 13 pages. Buffalo: Growing Food Connections Project, 2018.